I am excited to bring to you, a one of a kind competition. I have teamed up with the lovely Kat at Slugs & Snails to bring you this exclusive competition, TO WIN A PAIR OF SLUGS & SNAILS! 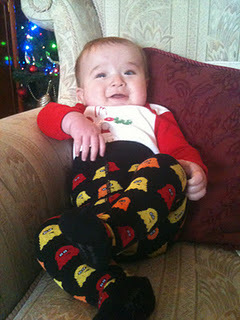 A little about Slugs & Snails: Slugs & Snails: Bright Tights for Bold Boys! At Slugs and Snails we’re all about vibrant colours and individuality. Our tights are as bold and bright as your little boy is. They will give him freedom to bend and move, keep his legs snugly warm, and mean no more hunting for missing socks for you! Leo is a avid wearer of these bright and exciting tights. We absolutely love them. You can really work them with their innovative designs that every little boy will just adore. They have been a godsend this winter and I will be using the next size up when winter descends again. From Saturday the 3rd March 2012 until Friday the 9th March you can enter and be in with a chance to win a pair of the coveted Slugs & Snails by just following these simple instructions! - Head on over to the Slugs & Snails website and have a look through their exciting range, pick your favourite pair of tights and leave me a comment below, and you could be in with a chance of winning them next Friday! Good Luck Everyone and please spread the word! 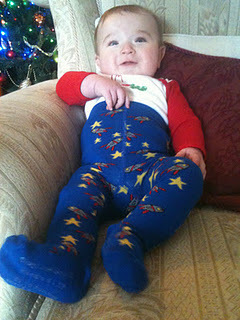 These are great, I always put my little boys in tights but just end up buying navy blue girls ones! My favourites are definitely the rockets and stars. My favourite are the Spooked! It's got to be the High Flyer! High Flyer! They are amazing... my little boy would love them as he's obsessed with Aeroplanes- what an amazing idea!!! Ahoy! My little one wears sleepers daily... these will be perfect! gutted I missed out on this!